Tragic misdiagnoses in the emergency room led her family to establish R Baby Foundation. 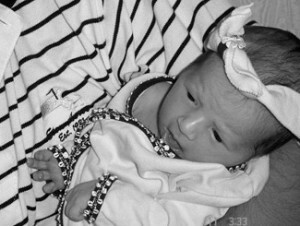 Our daughter Rebecca was born four weeks early on July 13, 2006. We loved her from the moment of birth and savored every hour with her. She was released from the NICU five days later, supposedly as a healthy baby girl. The next day, Rebecca was severely congested with thick mucus, continuing her slow feedings, and had difficulty breathing. We took her to the pediatrician and the hospital emergency room during each of the following days we had her. Doctors diagnosed her symptoms as a common cold, and she was repeatedly sent home. Unfortunately, Rebecca passed away on the morning of July 21. We later found out that she had contracted a common enteroviral infection. Had her symptoms been treated, she may still be here today. As a result of this tragedy with Rebecca, we created the R Baby Foundation. This charity is dedicated to helping newborn babies, primarily those less than a month old suffering from viral infections and other infectious diseases, receive the highest quality of care and service through supporting education, research, training and life-saving equipment.